October 30, 2014 – Halloween Party II: The Spookening! Fifteen Halloween-y songs with a huge amount of variety! BEHOLD, MORTALS, A DELIGHTFUL SELECTION OF SONGS FOR THE ROCK BAND THREE VIDEO GAME. CLING TOGETHER IN YOUR PITIFUL HOVELS AND WAIT FOR THE END WITH TRACKS FROM ROCKWELL TO SKRILLEX AND EVERYTHING IN BETWEEN. A CORNUCOPIA OF DELIGHTS. GATHER IN YOUR MEETING PLACES AND PRAY FOR DELIVERANCE. WHILE YOU ARE THERE, YOU CAN AVAIL YOURSELF OF THREE SONGS FROM THE CLASSIC VIDEO GAME FRANCHISE SILENT HILL, OR THREE MORE SPOOKY PONY SONGS. WHETHER YOU ARE DESTROYED IN A BLAST OF HELLFIRE IN THE FIRST HOURS OF THE COMING END, OR YOU SURVIVE TO THE LAST TO WATCH YOUR FAMILY AND COMRADES SUFFER, YOU HAVE AN UNRIVALED SELECTION IN ROCK BAND HALLOWEEN ENTERTAINMENT. FORGET NOT TO PERUSE LAST YEAR’S HALLOWEEN SELECTIONS. “THIS IS HALLOWEEN” ALSO JOINS “KIDNAP THE SANDY CLAWS” IN REPRESENTING THE HUMAN FILM NIGHTMARE BEFORE CHRISTMAS. AS YOUR FLESH SLOUGHS FROM YOUR BONES IN THE BLACKNESS THAT LIES BEYOND BLACKNESS, USE YOUR LAST MOMENTS TO DOWNLOAD ALL SONGS FROM THE C3 DATABASE. THERE WILL BE NO NEXT FRIDAY. THERE IS ONLY OBLIVION, FOREVER. SEE YOU SOON, FLIMSY CREATURES. October 24, 2014 – Cake 4-pack and fandom singles! Not that kind of cake. Hey everyone! 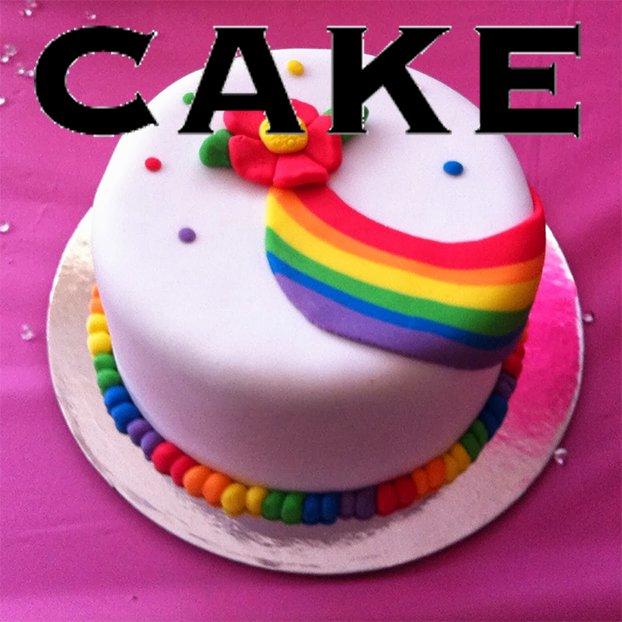 This week we’ve got four tracks from California alt-rockers Cake, another one of those bands conspicuously absent from official DLC. We’ve got almost all of the big singles (minus “Sick of You”, I guess), so get ready for some sick basslines and catchy trumpet hooks! I will also take a rare liberty as the author of these blog posts to comment that Cake is amazing and you should feel bad if you don’t download these songs. Cake C01 – I (pksage) am a big fan of Cake, and I’ve wanted this pack since RB1. I wanted to include at least one song outside of their big singles — much like Rocksmith got “Stickshifts and Safetybelts” — and “Opera Singer” fits the bill nicely. Honestly, though, it would take an album release of Fashion Nugget before I would feel sated with our Cake selection. And then probably an 8-pack after that. Regardless, though, these big hits should be plenty of fun on their own. Big thanks to Ollie and EvilCornbread for making it possible! If you like Cake, don’t forget that we also released “The Distance” last year, if you’re wondering why it wasn’t in this pack. Hit our song database to download all past, present, and future C3 songs. October 17, 2014 – Six classic rock tracks, including Robert Palmer, Deep Purple, "Baby Come Back", and three ELO hits! A red X denotes Pro Guitar/Pro Bass charts, a blue M denotes full multitracks, a blue K denotes a “karaoke” multitrack (separated vocals), and a rusty 2x denotes that a 2x Bass Pedal version is also available. “FtV” denotes a song previously released by a C3 author outside of C3. “Classic rock” as a genre is a bit suspect, much like “indie rock”. I mean, something can be both Classic Rock and, like, hard rock, or soft rock, or folk rock, or…you get the idea. We’re confident, though, that this batch of tracks are both Classic and Rock, and we’ve got a FtV ELO 3-pack to seal the deal! This week also welcomes RBN author Arcanon to C3 with the first of many RBN tracks that didn’t quite make it. Taken together, this week is a bonanza of multitracks and Pro Guitar, and our Q4 is still just getting started! If you like Deep Purple, remember to get “Space Truckin'” and “Child in Time” as official DLC, and “Fireball” as a C3 custom! We’ve also released four other ELO tracks since our inception — “Do Ya”, “Don’t Bring Me Down”, “Sweet Talkin’ Woman”, and “Rain Is Falling” — bringing our total ELO roster to seven. Check out the song database to download all of these! October 10, 2014 – Toto 5-pack and 21 RBHP upgrades! A red X denotes Pro Guitar/Pro Bass charts, a blue M denotes full multitracks, a blue K denotes a “karaoke” multitrack (separated vocals), and a rusty 2x denotes that a 2x Bass Pedal version is also available. [FtV] denotes a song previously released by a C3 author outside of C3. I bless the rains down in Munchkinland! Sometimes a pack needs no fancy description or subtitle, and classic rock legends Toto speak for themselves. So hey, welcome to October — “Africa” and “Hold the Line” are finally here! The weather is cool, the packs are hot, and it only gets better for the rest of the year. Remember that the official DLC store is still up, and “Rosanna” awaits you there to flesh out this pack if you don’t already have it. We’ve also got 21 new Rock Band Harmonies Project upgrades, courtesy of the never-flagging espher with special guest Lowlander! This week covers Screaming for Vengeance and Are You Experienced, along with a host of metal singles and other goodies. Check the end of this blog post for the full list, or go to the RBHP site to download the upgrades. October 3, 2014 – Queensrÿche's "Operation: Mindcrime", plus Silversun Pickups, The Raconteurs, Attila, and Cold! Who do you trust when everyone’s a crook? Why, us, of course! Take a break from your mind-control-serum-induced assassination spree to play another full Queensrÿche album! In a C3 first, you can download the whole album at once to join Nikki on lead guitar, Dr. X on bass, and Sister Mary on drums for a legendary rock opera experience. Or pass on the drama and intrigue entirely, and rock out to some awesome mixed singles. Operation: Mindcrime is arguably the best and more appreciated metal concept album, certified platinum and repeatedly ranking in the top 50 albums ever released by numerous magazines. It’s got a compelling story and in Rock Band it plays just beautifully. All instruments range from easy and enjoyable to hard and challenging, though never getting frustrating. And the vocals are stunning: Geoff Tate is one of the purest voices in rock history and keeping up with him will just leave you breathless. If you like discovering new music that plays well in the game, do yourself a favour and play just once the whole album on any instrument: you’re gonna be hooked. So, play through the story of Nikki, a junkie who is recruited by an enigmatic Doctor X with the intent of having him kill political leaders and subvert society’s order. Ideology slowly gives way to reality when, at the climax of the album, in a 10 minute epic with an amazing duet and latin choirs, Nikki is asked to kill the only beacon of hope in his life. Nikki’s life unravels and the inevitable ending of the album leads to him realising what he’s done. – The album is available in singles and, for the first time ever in C3 history, as a whole album package (expect more in this format). Plus, the album is also available in a single package with all the medleys intact, so that you can play it with no intended interruptions. – Spreading the Disease has an amazing drum line achieved by assigning snare to green: try it and love it. – In Suite Sister Mary the latin choirs have not been charted and are treated as backing. The reason is that while we know what should be sung, and even if we have people somewhat familiar with latin, not all lyrics are clear. Also, the choirs sometimes overlap with the 3 “natural” harmonies. – Throughout the album, whenever there are spoken bits, H1 is Nikki, H2 is Mary, H3 is Dr. X. – Finally, this album couldn’t have been done without xlxAvaricexlx’s impressive guitar and drums work, plus more instruments on some songs. In fact, Queensrÿche haters please consider one thing: him authoring Empire was one of the main reasons I got into customs, so if you ever downloaded a song of mine that you loved, make sure to thank Queensrÿche! And xlxAvaricexlx, we finally got this one out, thanks for all the stuff you did! The Raconteurs – Finally! Long overdue GH ports, by my estimation. Both of these tracks from Consolers of the Lonely are great on guitar, but none of the instruments are ever boring. For best effect, play an album-order setlist with “Salute Your Solution” and “Many Shades of Black”. Steppenwolf – “Born to Be Wild”: Important fix. Was accidentally released in mono with one audio channel missing, now correctly stereo again. If you liked this album, farottone has released several other full Queensrÿche albums, including Promised Land, The Warning, and Empire, the last of which includes full multitracks for all songs! And if you’re a Silversun Pickups fan, check out “Substitution“. All song downloads are also available in our database.